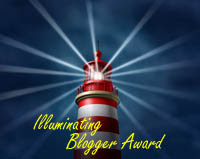 Once again Lisa Alzo has brought back Fearless Females, the blogging prompt to celebrate National Women's History Month. Today's prompt: March 7 — Share a favorite recipe from your mother or grandmother’s kitchen. Why is this dish your favorite? If you don’t have one that’s been passed down, describe a favorite holiday or other meal you shared with your family. Grandma Smedley made the best cookies! I know I am not the only grandchild to think so. She would make a double batch and freeze some of them so there would always be cookies in the cookie jar when a visitor may appear. Every time we went to grandma's after getting mauled at the door I made a bee line to the cookie jar. If it was winter my next stop would be sitting on the floor in front of the heater with a cookie in each hand. If it wasn't winter, the rocking chair would suffice. When I make cookies this is my go to recipe. However, I always skip the nuts. I can't say that I have ever put the cookie dough in the fridge before baking either. bag. 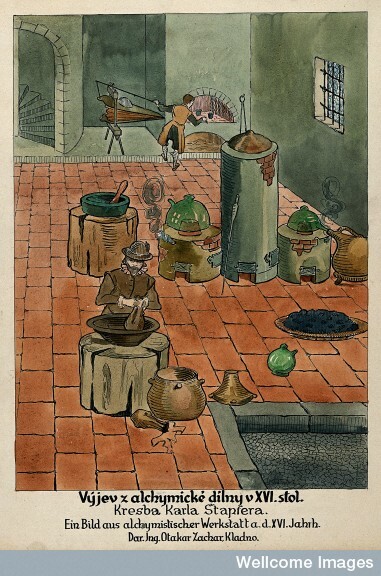 Watercolour, 1934, by V. Kalibaafter K.
Stapfer after a 17th century MS. 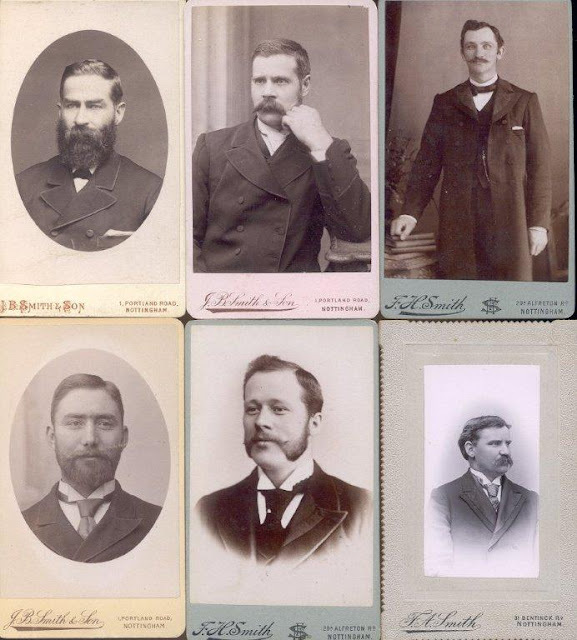 I made some new discoveries about my 11th great-grandfather Dr. Patrick Saunders while I was making a little project page for mom's birthday. As far as I know he is the only doctor out of all of my ancestors. But, you never know. That could change. I am intrigued now more than ever with our doctor. Before he earned his medical degree from the University of Franeker in August of 1619 he was a pupil studying under the wing of John Dee who was a "mathematician, astronomer, astrologer, occult philosopher, imperialist and adviser to Queen Elizabeth I. He devoted much of his life to the study of alchemy, divination and Hermetic philosophy." Patrick started his tutelage under Dee about 1603. At the time of Dee's death in 1608 Patrick was one of his assistants and ended up with several of his manuscripts. He certainly ran in famous circles. Besides John Dee his friends and colleagues included the likes of Henry Percy, the “Wizard Earl” of Northumberland, Elias Ashmole, John Pontois, Joachim Morsius, John Woodall, Arthur Dee, and Richard Napier. Saunders was incorporated at Oxford the 2nd of December,in1619. He, was admitted a Candidate of the College of Physicians the 30th of September, 1620. He had been under the watchful eye of the college censors beginning in 1613. 25 Nov 1617 - Entry: S[aunders] failed to appear. Attitude of the accused: absent Action taken: Failed to appear. 2 June 1620 - Entry: S[aunders], now MD Franeker (28 Aug 1619), had been incorporated at Oxford on 2 Dec 1619. He was examined and approved for the first time. Action taken: Approved on first examination. 7 July 1620 - Entry: S[aunders] was examined and approved for the second time. Action taken: Approved on second examination. 1 Sep 1620 - Entry: S[aunders] was examined and approved for the third time. Action taken: Approved on third examination. Michaelmas 1620 - Entry: S[aunders] was examined and approved for the fourth time. Action taken: Approved on fourth examination and elected CRCP. m Palm Sun 1623 - Entry - Patrick SAUNDERS 648, a Candidate, accused John Glassington, of Knightsbridge, of having given courses of physic, for instance to Mrs. Jone Jacob of Horsey Downe, unction and diet for cancer of the uterus. m Palm Sun 1623 - Entry - SAUNDERS (qv, 648) reported that Mrs Nokes of Wapping, a midwife, had obtained julep and cordials from Robert Holland in Fan Church Street, and had given them to Mrs Southen of Wapping. 2 March 1627 - Entry - Richard Edwards was accused, but Dr Saunders (?his accuser) was not present, so the matter was deferred. 2 Nov 1627 - Entry - Robert Holland, called Henry Holland erroneously (according to a note in the margin of the next entry), was charged by Dr Clarke and Dr Saunders with practice in the case of the late Mr Buffield, of Mr Haslewood's son, of Mr Gardiner, of John Hide and of one Throckmorton. H was ordered to appear. 22 Nov 1627 - Entry - Robert Holland appeared and was accused by Dr Goulston, Dr Spicer, Dr Saunders and (especially) Dr Clarke of malpractice and of passing himself off as a physician. His defence was inept and all the 21 Fellows present undertook to boycott him. 7 Dec 1627 - Entry - Robert Holland was gravely charged by Dr Saunders and others. 28 Jan 1631 - Entry - Dr Saunders said that Richard Edwards had given Mrs Ward of St Helens a violent course of medicine, and that she later died. Dr Rand confirmed this. Dr Saunders also reported [that E had given] medicines to a scorbutic penitentiary and to a boy with hectic fever. 28 Jan 1631 - Entry: S[aunders] accused George BUTLER (135, qv) of giving mercury pills to the wife of Captain Paparelli of Redriff, causing severe salivation. (Goulston knew about the case.) Action taken: ? 23 Sep 1631 - Entry S[aunders] accused George BUTLER (135, qv) of giving 8-10 mineral pills to Mr Askue of Bridwell dock. Action: taken ? I find it very curious that he was accusing folks left and right for the same practices that he used. Was he deflecting from himself, or slimming the competition? John Dee was also referred to as a "wizard". According to Jason Louv he was the 16th century's real-life Gandalf. Do I dare say that that would make my 11th great-grandfather like a sorcerer's apprentice. 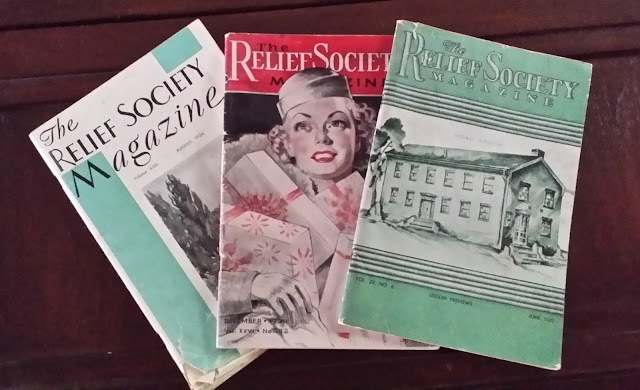 Today's installment of treasures fits quite nicely with last week's Treasure Chest Thursday ~ Relief Society Magazines. A couple of days ago I received a copy of the book The Salt Lake City 14th Ward Album Quilt, 1857. I have wanted this for a long time. There's an interesting story leading up to the publishing of this book. Carol Holindrake Nielson the author tells how her husband inherited half of a quilt. I know right. Half of a quilt. At the age of twelve Richard Stephen Horne won the beautiful quilt that was hand stitched by the Relief Society women of Salt Lake City's 14th ward. The year was 1857. 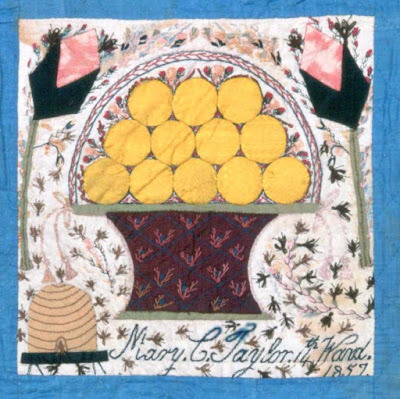 He held on to that quilt until his first wife died in 1896. That's when he cut the quilt right down the middle. One half for his oldest daughter, and the other half for his second oldest daughter. And to quote Carol's words and my own sentiments "Only a man could do that!" 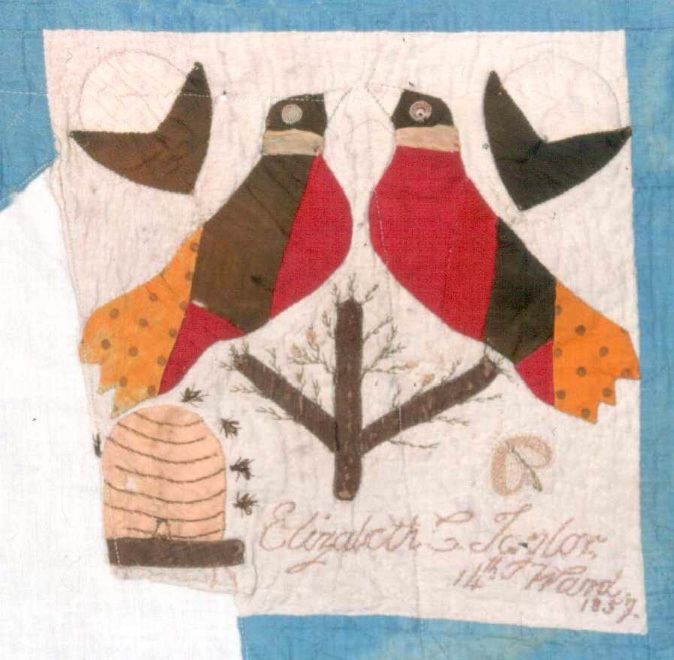 130 years later the quilt halves were reunited thanks to a little research from Carol. Not only a reunion of an heirloom, but a meeting of distant cousins. How cool is that! 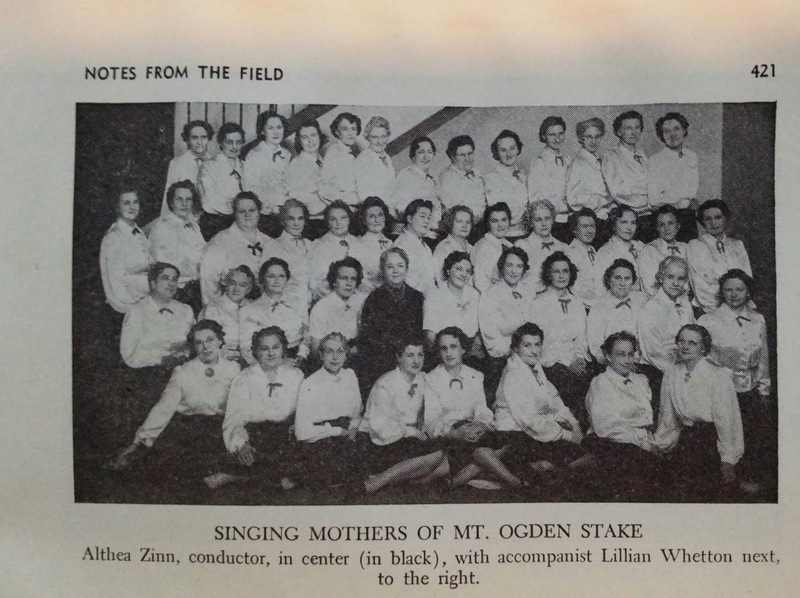 I am so grateful that the author felt that this treasure should be shared with the posterity of these crafty pioneer women. She researched and learned about the women of the 14th ward Relief Society and voila...a book. 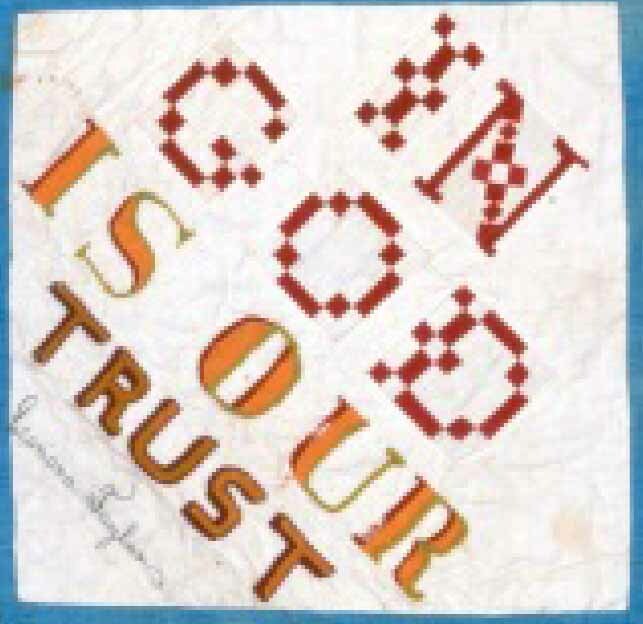 I have three connections to this quilt. 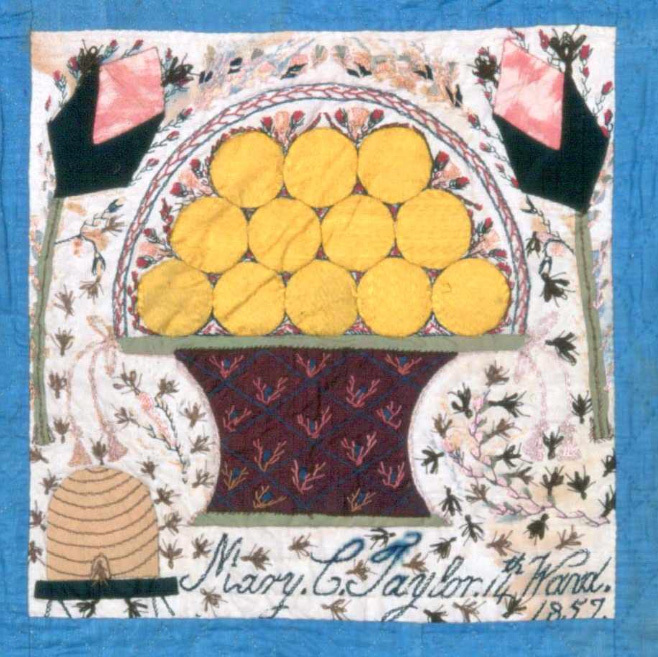 The block above was embroidered by my 3rd great-grandmother Mary Edwards White Cannon Taylor. The block below was done by her daughter and my 2nd great-grandmother Elizabeth Edwards Cannon Piggott. She was 12 years old at the time. Unfortunately a piece of hers is missing. However, thankfully her signature is intact. She used her step-father's last name of Taylor. The other connection is a block done by Leonora Cannon Taylor. She was the aunt of Elizabeth Cannon and the sister of my 3rd great-grandfather. 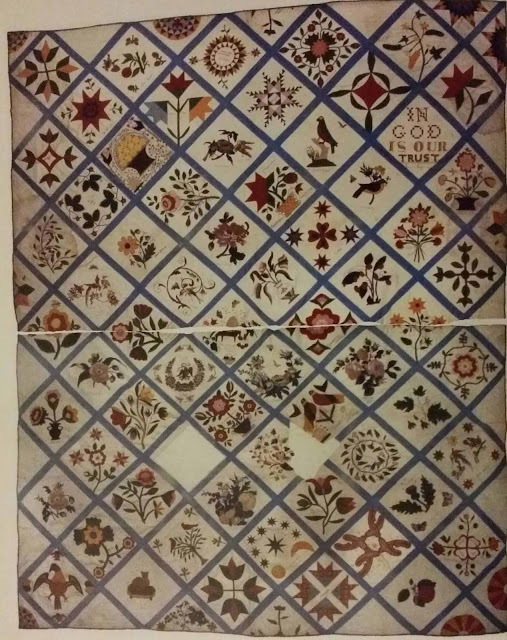 I may not be able to pass down a quilt, but I can pass down this book with a snippet of the beautiful needlework of my ancestors. 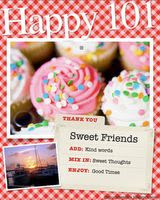 Thank you Carol Holindrake Nielson! When I was back home last September helping mom go through stuff and pack to move out I discovered these old goodies that she didn't want. Actually only two of them have her name on them. The other one has the name "Mrs Ethelyn Bee" stamped on it. I had never heard that name before, but I discovered that she is grandma Hazel's first cousin once removed. I found some photos and newspaper articles on her FamilySearch profile. Poor woman died in an automobile accident. The Relief Society Magazine is an excellent genealogy and family history resource. 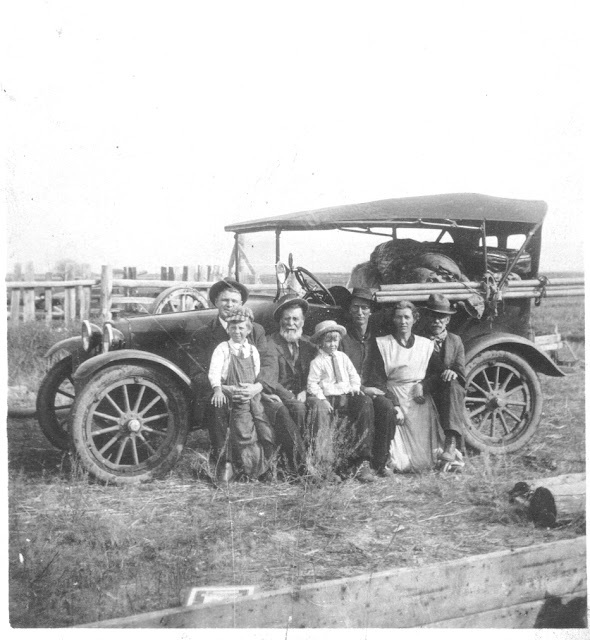 Many issues are filled with photographs, true pioneer stories, and other events your ancestor may have been involved with. 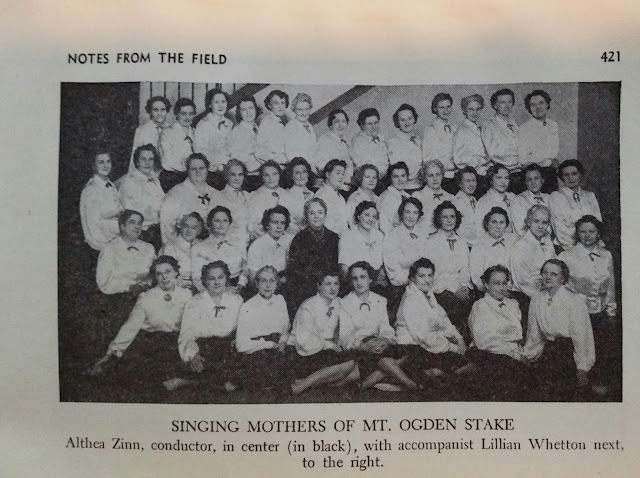 If you have ancestors that were in the Relief Society, or are just interested, you can read digital copies of some of the Relief Society Magazine issues on the BYU library website. I have been busy scanning old issues and with my addiction to Geni, you know I had to create a project. 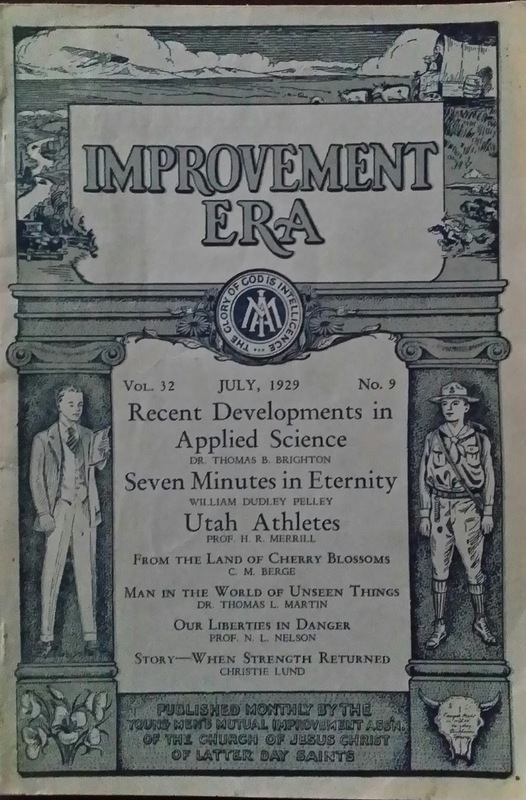 There were also two other LDS journals. One of them belonging to grandpa Bill. This one is called the Improvement Era. You can also read some of these online. 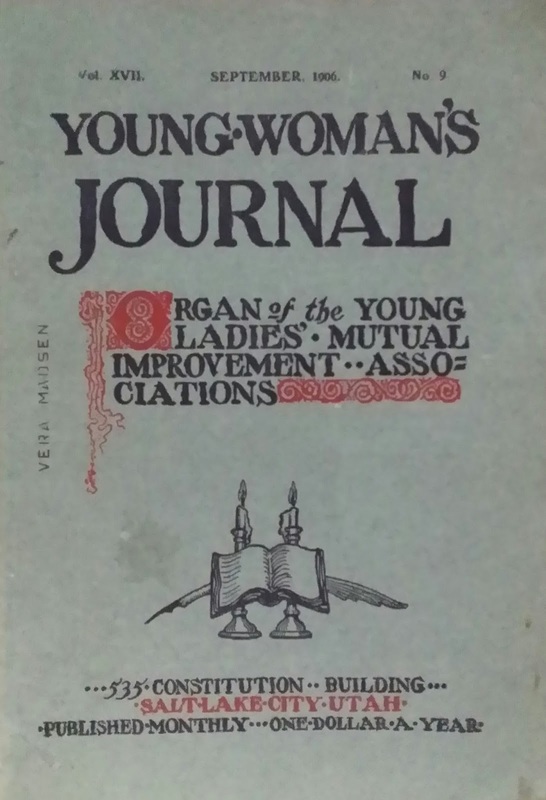 The other one is called Young•Woman's Journal and it belonged to Vera Madsen who is a cousin of grandma Hazel. 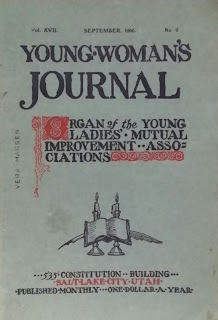 There are a few issues of these at Hathi Trust Digital Library. 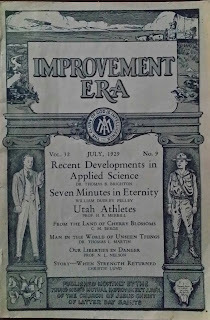 I'm sure that these magazines were among the ephemera that grandma Hazel kept. And I'm quite sure that's where my obsession for ephemera gene came from. 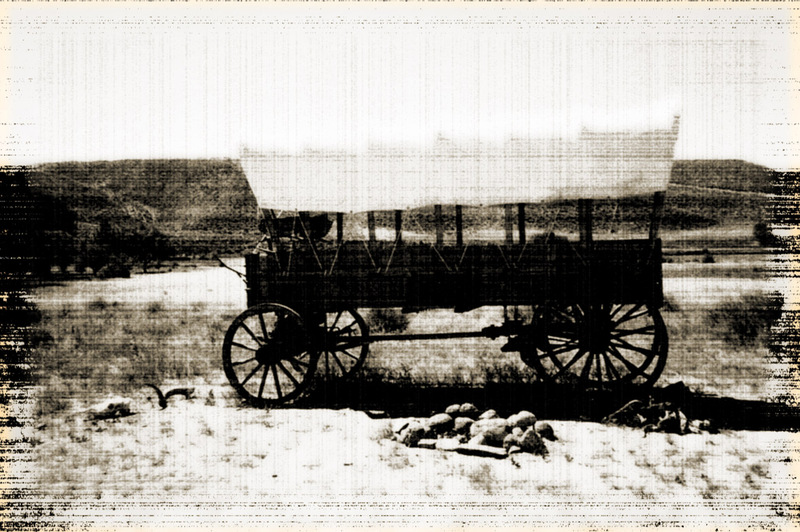 I meant to get this post done Friday for Pioneer Day, but that didn't happen. Ellenor Creighton is my 3rd great-grandmother and one of my mysterious brick wall ancestors. For quite some time I thought that she was buried in Fish Haven, Idaho. Only because that's what the Eastern Idaho Death Records indicates. And, of course I made a memorial for her in the Fish Haven cemetery on Find A Grave. Boy did I feel silly when I discovered someone else made a profile for her years later in Laketown, Utah with a headstone photo and everything! The creator graciously transferred management over to me. The last time I was in Idaho my aunt took me to the Laketown cemetery so I could see it for myself. It took us forever to find her. It wasn't until we both got frustrated and I said out loud, 'where are you grandma Ellenor?' that I found her. I'm serious. Finally I was able to take my own photo. Let's back up just a bit. It was actually another record that lead me to the discovery of her correct burial place. 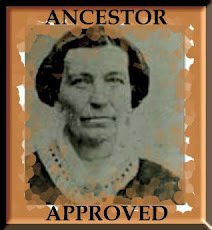 She was listed in the Membership of The Church of Jesus Christ of Latter-day Saints: 1830-1848 database on Ancestry.com with her family which can also be found through FamilySearch. We have always spelled her name as Eleanor, but she was recorded here as Ellenor. That's when I started googling her in a different way. I found her sailing aboard the Camillus listed as Ellen Creighton. That's when I discovered that she was traveling with a sister named Jane. The sisters were among 228 saints dubbed the "SIXTY-SEVENTH COMPANY" that set sail from Liverpool 6 April 1853 arriving in New Orleans 7 June 1853. From New Orleans they took passage on a steamboat to St. Louis, MO and then on to Keokuk, Iowa where they camped before heading to Utah. Unfortunately no journals or records have surfaced that tell of her journey to Salt Lake so we don't know for sure which Pioneer company she traveled with, but I believe she left there with the John Brown Company. Her sister Jane married John Tempest Leffen while in Keokuk. 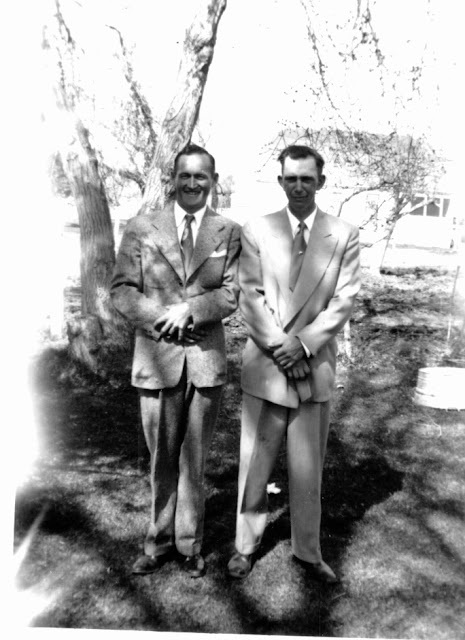 Ellenor married my 3rd great-grandfather Joseph Hyrum Pugmire three years after arriving in Utah. Still hoping to find more information on this mysterious Pioneer ancestor. 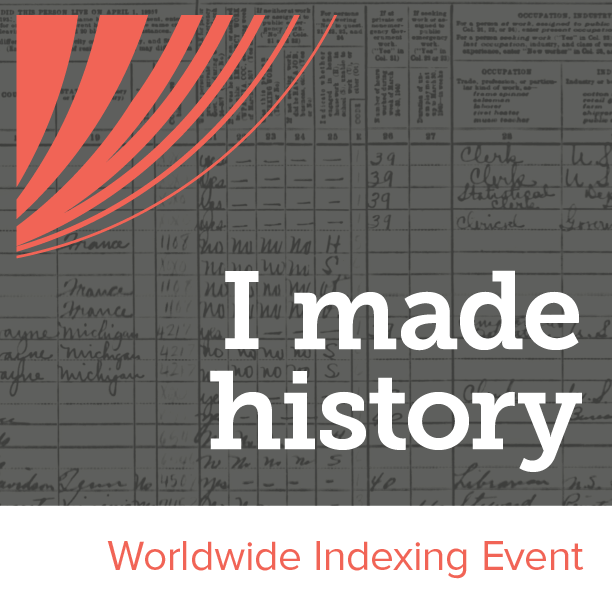 A few weeks ago I made contact with a distant cousin that I discovered through FamilySearch. It's not always easy to connect with others on FamilySearch because not everyone leaves an email address. The reason I was so excited to reach out to him is because he uploaded a wonderful document that lead me to new discoveries. Danish discoveries. I have always been afraid of dreaded Danish research because of the naming traditions. To me it was like trying to find the right John Smith, if you know what I mean. Besides that, I don't speak or read a lick of Danish! This new information I have learned has me infatuated with my Danish Roots and I want to find more. So that means I need to find a little fortitude and push forward. 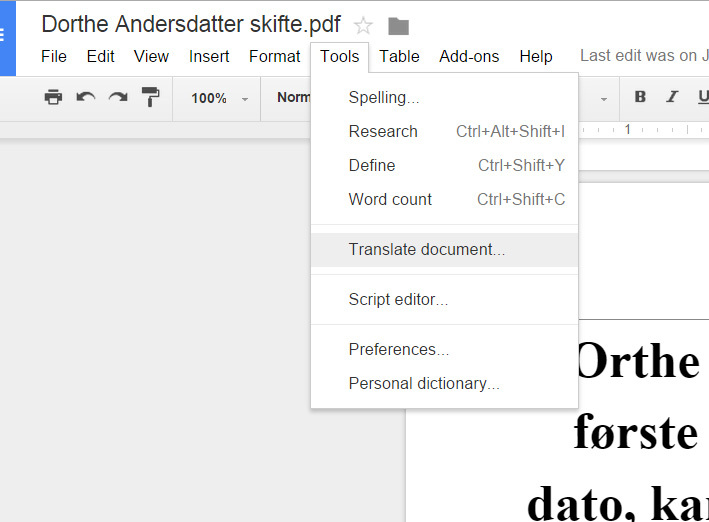 So I wanted to tip you off to some websites that may help you with your Danish research. Erik Brejls website - There are transcriptions of probate records available here. What's that you say? You can't read Danish either? There's no need to fear, Google Translate is here. Another handy tool is Google Drive. 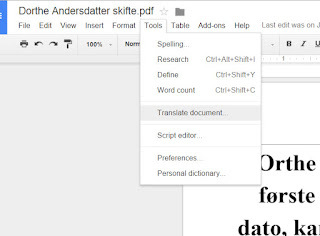 If you have a .pdf document written in Danish, simply upload it to Drive, right click on the document and open with Google Docs. 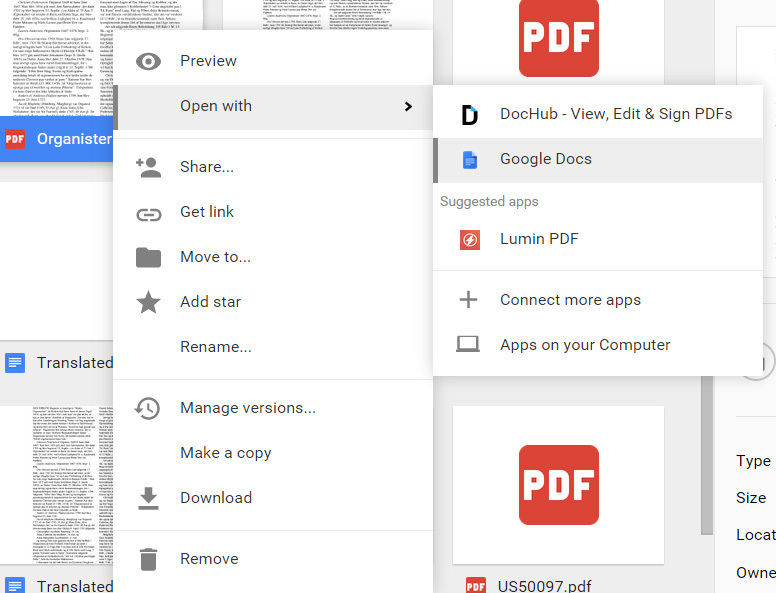 Once it is opened click on tools from the menu above and then click on 'translate document' from the drop down menu. 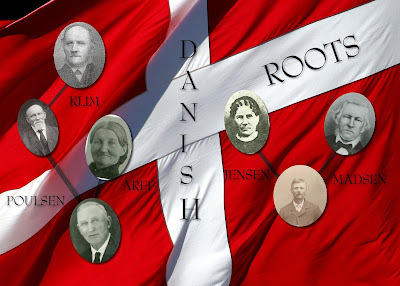 Danish Wordlist - A part of the Denmark genealogy page on FamilySearch Wiki. 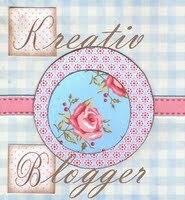 I also wanted to share some other exciting news with you. Kristian Pedersen is working on docudrama called The Descendant. He just got back from Copenhagen so there will be an episode about Denmark. I'm not sure when the tv pilot is, but I can't wait. I hope I have been of some help or maybe I'm the last one on the boat. If I left something out, please share in the comments. These photos were a part of grandma Nancy's photo album. I guess they could be family members, but I am thinking that they were missionaries that stopped by her house in Arnold, Nottinghamshire, England. 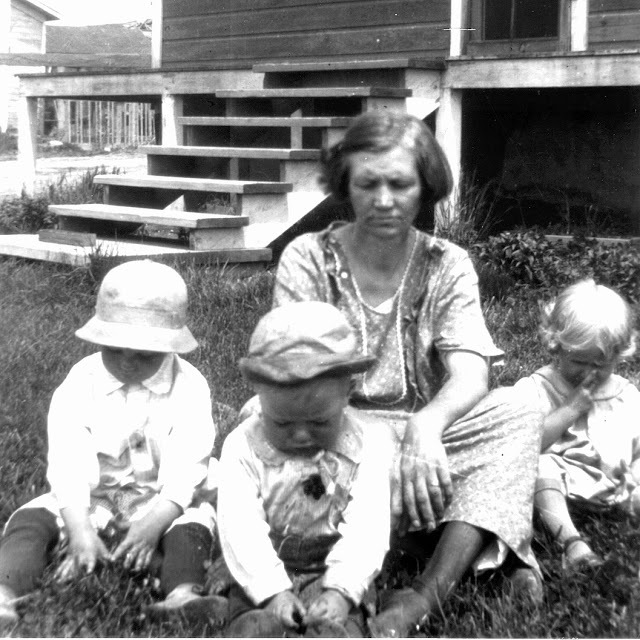 She took lodgers in after her husband passed to help feed the family. Grandma Nancy left England for the U.S. in 1899 so I know the photos were taken sometime before then. Hopefully someone out there will recognize these faces.